Howlite is usually white with black or brown veining. It encourages healing by calming physically and emotionally. It dispels negativity and spurs ambition toward positive goals. 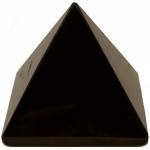 Beautifully polished 2" gemstone pyramid. 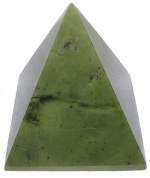 Very rare dark Nephrite Jade gemstone 2" pyramid. One of the most auspicious stones in Chinese culture, Jade has been treasured as a "Bringer of Good Fortune" for centuries. Jade has been used by shaman world wide as a sacred stone, affording one access to the spiritual realm. 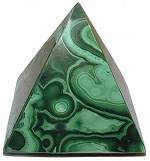 Beautifully polished rich dark Nephrite Jade 2" gemstone pyramid with black Jade markings. Special purchase Black Nephrite Jade gemstone 2" pyramids from china. Jade was used as a sacred stone in multiple cultures, affording one access to the spiritual world. It helps to attune one to the needs of others and inspires wisdom during the assessment of problems. 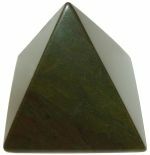 Beautifully polished Black Nephrite Jade 2" gemstone pyramid with dark green hues. These high quality Labradorite pyramids are a rare find! The lovely Feldspar polished pyramids have abundant peacock colored fiery luminescence. 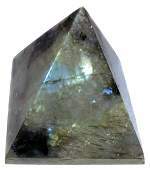 Labradorite facilitates change in trying circumstances, plumbing the strengths of the inner self. Beautifully polished 2" gemstone pyramid. A first time ever offering of rare Australian Jet 2" pyramid! These hand carved Jet Pyramids have a brilliant polish and very few imperfections. Jet is fossilized carbon used for centuries as a talisman believed to purify and protect it's possessor from illness and violence, as well as grounding the emotions in times of great stress. Beautifully polished Australian Jet 2" gemstone pyramid. Lapis consists mostly of the mineral Lazurite which has been mined for over 5000 years. 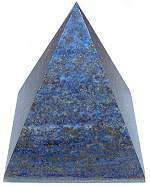 Lapis Lazuli was the revered stone of Ancient Egyptian King-Priests and Queen-Priestesses. It was said to exist before time was born and admit one to the sacred mysteries. 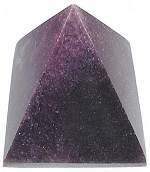 Beautifully polished 2" gemstone pyramid. Lepidolite is an unusual Mica silicate with heavy Lithium deposits which create the purple and violet hues. It is said to have a refreshing energy of lightness, hope and acceptance. 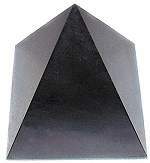 Beautifully polished 2" gemstone pyramid. Hand carved and polished iridescent Moonstone pyramids from India, have a pearl like reflective sheen. Moonstone is a feldspar like Labradorite, however it is an ancient, mysterious stone, connected to the Divine Feminine and the unseen spirit. It illuminates the inner self and strengthens intuition and the subconscious dream world. Beautifully polished, hand carved 2" and 2 1/4" India Moonstone pyramids. Beautiful Rainbow Moonstone 50mm pyramids from India. Moonstone is part of the feldspar group like Labradorite and has flashes of blue and green fire known as adularescence. These hand carved and polished pyramids have a white gray pearl like matrix with black tourmaline inclusions and many areas of blue fire. Moonstone is a stone of new beginnings, it illuminates the inner self and strengthens intuition and the subconscious dream world. Beautifully polished 2" gemstone pyramid. 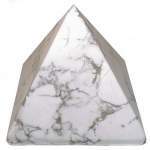 Beautiful polished 2" gemstone pyramid. Hematite has been considered a "Stone of the Mind", enhancing mental attunement and original thinking. This gemstone is mysteriously heavy and has the appearance of a polished silver mirror.